Are you exhibiting at a trade show in Louisville? Do you need assistance creating a spectacular trade show display? Metro Exhibits can help. We provide purchase trade show displays, rental trade show exhibits and much more to satisfy all of your exhibiting needs in Louisville, Kentucky. Louisville is the biggest city in the Commonwealth of Kentucky and the 30th-most populous city in the United States. It’s one of two cities in Kentucky designated as first-class, the other being the state’s second-largest city of Lexington. Louisville is the historical seat and, since 2003, the nominal seat of Jefferson County. 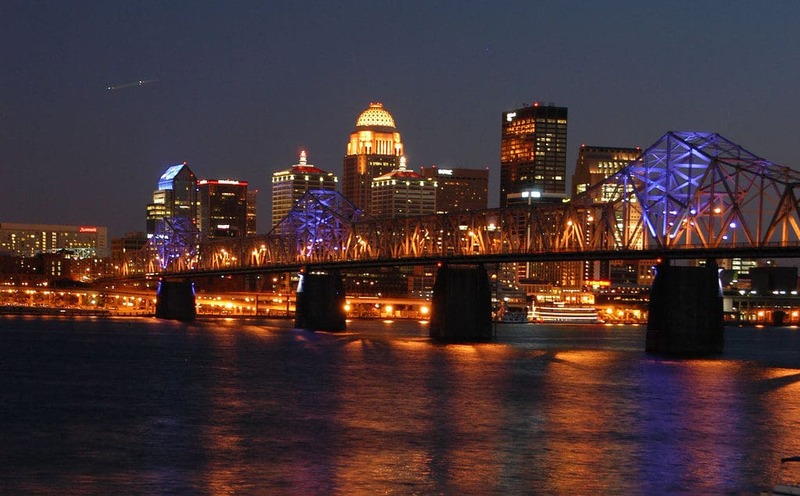 Today, the city is known for being the home of the Kentucky Derby, Kentucky Fried Chicken, the University of Louisville and its Louisville Cardinals athletic teams, Louisville Slugger baseball bats, and three of Kentucky’s six Fortune 500 companies. The city’s main airport is also the site of United Parcel Service’s worldwide air hub. Louisville today is home to dozens of companies and organizations across several industrial classifications. However, the underpinning of the city’s economy since its earliest days has been the shipping and cargo industries. Its strategic location at the Falls of the Ohio, and its unique position in the central United States make it a practical location for the transfer of cargo along its route to other destinations. The Louisville and Portland Canal and the Louisville and Nashville Railroad were important links in water and rail transportation. The Kentucky Exposition Center is the premier trade show, expo and conference center. This location offers one of the largest expo centers in the country being 1.3 million square feet. Additionally, the facility holds 54 meetings rooms with large flexible layouts. NAT’L JR SUMMER SPECTACULAR & CONFERENCE , 2017 AMERICAN HEREFORD JR NATIONAL SHOW , GREEN INDUSTRY & EQUIPMENT EXPO, DERBY CITY COMIC CON ,NORTH AMERICAN INTERNATIONAL LIVESTOCK EXPOSITION , CHRISTMAS GIFT AND DECOR SHOW. At Metro Exhibits we understand the needs of companies and organizations to stand above all others. Branding, the practice of building a lifelong preference amongst consumers to choose and patronize your company, is of crucial importance. At trade shows exhibits and conventions in Louisville, KY, the ability to make an impression that will separate you from your competition is our goal. Metro Exhibits provides the best physical representation of your brand possible. In Louisville, as in other cities around the United States, we offer a full complement of trade show and convention services. We will work with you to create and design unique trade show and exposition booths, displays, and corporate spaces. Contact Metro Exhibits us to learn more about Louisville trade show rentals, sales and other trade show support services. The Kentucky Exposition Center is the premier trade show, expo and conference center. This location offers one of the largest expo centers in the country being 1.3 million square feet. Additionally, the facility holds 54 meetings rooms with large flexible layouts. The facility also offers over 300 acres of additional outdoor space and is located adjacent from the airport. Finally, the facility is located within minutes of downtown and has direct access to major interstates. For more information look here. Another great location for trade shows and conferences is the Ramada Plaza. This 45,000 Square foot facility offers great accommodations for small and medium sized events. Additionally, the facility offers 19 meeting rooms and flexible floor plans for all types of events. The center also offers shuttle service to the international airport and historical downtown area. For more information look here. Contact us today to review your needs for trade show display purchase or trade show exhibit rentals for your next trade show in Louisville, KY.